It was a glorious spring day today, the trees are budding, and my flower beds are coming back to life. Love AI’s Window Dies and the beautiful scenes. Thanks for the password reminder. When I look out my window I see new houses being build and a backyard that we’ll be turning into a lovely garden this year. We just moved into a new house in the country and are so happy to be living in such a natural environment surrounded by lovely people who made us feel absolutely welcome! I live outside of Denver and today I have seen beautiful snow, rain and sleet. Everything was so dry, but I see green today! A blessing!! Looking out my window right now I see gorgeous fir trees as one would expect to see in the beautiful Pacific Northwest. Out My window this week is the Las Vegas strip, on a short family vacation. Love the window die with the scene stamp. Thanks. I’m in a cool part of Australia and outside my window I see nothing but mist. The whole world is white! Sandy, I certainly don’t see see anything quite as beautiful out my window as your card, that’s for sure, lol. No flowers blooming in my yard just yet here in N.J. Your so talented and your paintings really have away of making you feel like your right there in it. It’s actually my birthday today Aprin 15th, I won’t tell you how old, lol. Your card made me feel like I was in a village in Europe somewhere standing in someone’s garden. Thank you for sharing and always inspiring me. I can see my big, big, big front yard with the white fence (Needs painting) along the road and partially up the drive. To the left is a big pond with a little island in the middle where our Canadian geese have returned again this year to lay eggs and raise their young. They have been coming for probably 12 years now and I look forward to their return every February. There is also a pair of Mallard ducks nesting on the island and their eggs just hatched this past week. It’s been so wet that mama mallard had her ducklings in a puddle. It looked to be about a dozen babies. They are so fun to watch. The other day when the ducklings were in the pond with mama mallard, daddy mallard was behind them all as if he was doing a roundup. The Canadian goose daddy-to-be was maybe 10 feet away as if he too was there to guard the little ones. A beautiful, breezy, not too hot day on the west coast of Florida…birds are singing, flowers are abundant and Edward, my dog, chasing the squirrels from bird feeding area…not bad at all! Love this card! 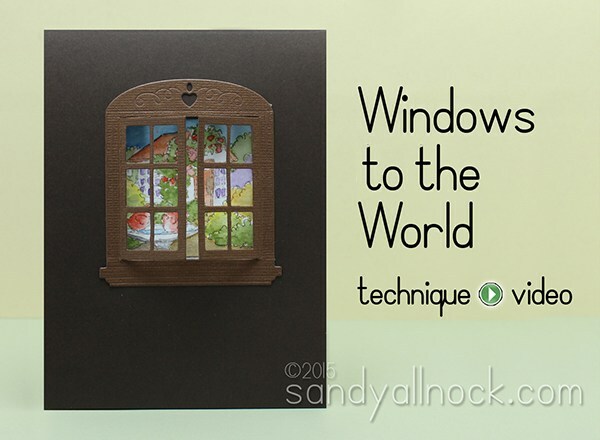 I love window cards, just so cute! These little scenes are wonderful, haven’t seen these before. I’m looking out at my backyard, enjoying the peaceful pond scene with some beautiful Florida birds and my pots of blooming spring flowers right outside my porch! Lovely scene! Finally…spring coming to NH…I see the first leaves of tulips coming up in our garden…!!! Since I live in the Seattle area (Maple Valley) I see lots of gorgeous sunshine and beautiful spring flowers popping up all over. Good Saturday morning to you! I absolutely love this card.. I bet it reminds you of your recent trip to Europe…. that’s what it reminds me of… Outside my window is a humming bird feeder which when I open I can hear the humm of their wings… and just beyond that is my backyard which contain my four pooches, then I can see the field which is my favorite part… it’s empty of society but full of nature.. the tall grass blowing in the wind with a little tree off to the right that the birds just love and the neighbors cat loves to hang out under…. birdwatching I am assuming just like me…. but by looks of his jaw, quivering, for a different reason. Thanks for allowing me to stop for a moment in my busy day and take a fresh breath of air and Thank God for all He has blessed me with. What a beautiful card, and gorgeous stamps! Outside my window today was my 7 year old very determined to learn how to ride her bike. I helped her a few times, but then she announced she was ready to give it a go herself. I was so proud to sit and watch her work with such determination all by herself! What a beautiful card! When I looked out my window today, I saw a lovely courtyard with trees, flowers, and a beautiful blue sky. The fact my employer provides us such a lovely setting is just one small part of why I love my job. I see a pair of cardinals flying in and out of my bushes! I’m sure they are building a nest. There are many other birds that seem to be living in those bushes……such melodies I hear in the morning!! I see my dad grilling lamb chops for dinner. Yum! 🙂 Great card. I have a window die (although not a shuttered die) that I have yet to use. This has been the perfect inspiration. Thanks! Out my windows I see lots of cars, busy road … one day I will see beautiful trees and flowers. I’m so fortunate to be living inCrete in a beautiful house with our living room upstairs. When I look out of the windows, I can see the Mediterranean from the front windows over the tops of the olive trees in our front garden and the Isle of Dia from one of the side windows. Today, the sea was dead calm and a beautiful colour and the sky was blue. Summer is almost here! Totally forgot to say I loved your colouring and the peekaboo. The view out my back wall of windows is one of green, green grass, a bright blue pool of water, and a full canopy of trees. There is a pair of bright red cardinals trying to establish their territory, and a trio of deer munching on the foliage on my azalea bushes! I see springtime – trees blooming – and happy birds singing. A great end to a long winter. Sandy thank you for reminding me how to stay safe on the net! Out side my window are cactus in bloom! And a couple of bushes in bloom. Rocks and a tiny bit of grass. But the Butterflies and humming birds love the flowers! I so enjoy just watching them flit from flower to bush! Have a wonderful day and I must go color something! Early morning, and the sun is shining lazily on my sleepy little tree-lined street casting shadows about here and there in random patterns…the flowering cherry tree is sparking in the sun against a bright blue sky….it’s peaceful now, but soon the school kids will be lining up to catch the bus….another day has begun. Love the windows look, such a warm, welcoming scene. Outside my window today are rain clouds, but also a sprinkling of daffodils just peeking out of the wet lawn. Ah, spring at last! Outside my window today I see beautiful yellow (Y15) – LOL!) daffodils!! Finally!!! I see lots of green grass and the Apple trees in bloom! One of these days I will make time for your edu series. I’m a couple of days behind on your blog but wanted you to know how much I truly appreciate your coloring videos. They have helped me go from hopeless to hopeful in my coloring! I’m not seeing anything out my window since I’m sitting on the back deck with a cup of coffee. What I do see are my five dogs being playful while enjoying the fragrance of my blooming lilacs. It’s been so rainy here in central Arkansas that it is just wonderful to be out here and be dry. I’m in love with my new deck! I live in Minnesota. The trees are budding and the grass is starting to green up. This is my favorite time of the year. Devil’s Lake, Lincoln City, Oregon. I hear the soothing sounds of the ocean, my friend softly snoring. I see day breaking, and at the same time I see the twinkle lights that frame the view of a placid Iake beneath a star filled sky. It’s so peaceful at this Beach Girls weekend, a tradition which started when a friend’s husband died suddenly. Such a neat card. Currently dark outside (6:15am), but yesterday I saw a deer walking through my backyard eating some type of bush as well as something in the grass area. Beautiful card, tyfs. I see my Abe Lincoln roses just beginning to bloom. Poor rose bush has had a hard time since it’s right under my neighbors pine tree and the pine needles keep it from prospering. Thanks for caring about us as well. I’ll change things up tomorrow. The cherry blossoms are drifting around with each gust of wind, covering every square inch of pavement. April showers bring down the rest of the petals. Love the stamp and coordinating dies! Such a lovely card and watercolored so beautifully, as always! Thank you for so generously sharing your talent always, Sandy. Today, as I look out the window from my craft studio, I see a mockingbird splish-splashing around in what he thinks is a bird bath — but it’s actually the water bowl for my five feral kitties! I’ve been seeing rain. It’s been raining here for a 3 or 4 days off and on. Good sleeping weather but not very conducive to getting things done! Love the window card! You renewed my interest in watercolors and my set of Kuretake Gansai Tambi came today. Tomorrow I shall paint!! Love you and your work! Btw, I’m in NC. Love seeing ll of your different creations. In Ohio, I finally see SPRING outside my window!!!!!!!!! Just lovely, Sandy! This is definitely something I must try!! I’m especially blessed today to be spending time visiting my parents. When I look outside their window, I see beautiful mountains, cacti, wildflowers in bloom, hummingbirds darting about, quail running along the desert sand, and sunny, blue skies! I love the beautiful view… but I really love spending special times with my parents!! Awesome card, love your water-coloring. You make it seem so easy. I see beautiful dogwood trees across the pond. I love the window cards! It is a cloudy day, hoping for rain, here in NW Iowa, temp close to 70 degrees. Farmers in the fields and Spring is here!! Loved the beautiful window card. The colors you used are awsome. My watercolors are very primative, so if I want to advance, I, too will need more colors!! Right now I see the rain washing away all the yucky pollen from my car. Beautiful card. Love the Art Impressions Watercolor sets, I’ll have to look into some of these window sets. Outside my window I see bright blue skies, green grass, my rhody and dogwood in full bloom and my kids’ soccer goals all set up for practice. I look at paradise everyday. Today the sun is shining and the farmers are working over the fields. The mourning doves, robins and red wing black birds are enjoying the feeders and our two pups are enjoying a field full of bright green tennis balls. Your beautiful scenes outside your “window” are gorgeous. Today it is cloudy and cool, but I have flowers outside my window. Still in pots – but we plan to get them into the ground soon.